Pheasant Run Golf Course is an upscale executive course; featuring 15 par 3’s, three par 4’s, multiple hazards, and large undulating greens. Pheasant Run is great for beginners while still remaining difficult for experienced golfers. There are three sets of zoysia tees to make every round a different experience. With lights strategically placed throughout the course Pheasant Run is the only course, in the St. Louis metropolitan area, offering 18-holes of “Night Golf.” Come out after dark and experience how enjoyable “Night Golf” can be. Other features of Pheasant Run include a large driving range with natural grass tees, putting green, and “The Roost” a full-service Bar & Grill. The “Roost” Bar and Grill opened in March of 2002 and offers a delicious banquet menu along with outstanding food & drink daily specials. The Roost is the perfect way to end your round at Pheasant Run. Unwind with your favorite beverage from our fully stocked bar while you relax and enjoy the natural surroundings. A horseshoe-shaped oak bar, with a barrel roll ceiling, accent the inside. 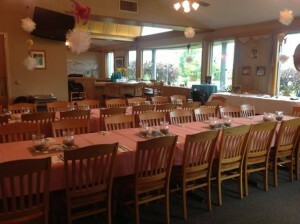 There is seating for approximately 50 guests in the main dining room, as well as outside seating for 40 on the patio. The Patio features heaters, a gas fireplace and a view of the 18th hole. The pro shop offers merchandise for your tournament prizes, as well as all your guests’ needs. The staff at Pheasant Run is committed to providing the best in customer service. Our goal is to make your outing special for you and everyone attending. 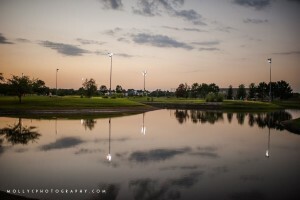 Feel free to call Dana Del Vecchio 636-379-0099 to schedule an appointment to view our beautiful facility. We are confident once you have seen our facilities that you will be booking your next outing with us. The driving range facility at Pheasant Run Golf Course has been voted in the top 50 every year since 2012! The range at Pheasant Run has a large grass area with four types of grasses to practice from. At the other end of the property, the Golf Headquarters range features grass and mat areas, as well as heated/covered tees. Pheasant Run Golf Course and Golf Headquarters Family Golfplex both feature putting greens for working on your short-game.